Every two years, the Bureau of Labor Statistics makes a projection of what the nation’s workforce will look like 10 years into the future. Its latest projection, released last month, foresees an America in which more people work longer into their older years. By 2022, the agency projects that 31.9% of those ages 65 to 74 will still be working. That compares with 20.4% of the same age bracket in the workforce in 2002 and 26.8% who were in the workforce in 2012. The agency’s data finds the dividing line is age 55: labor force participation is expected to fall for those under that age who are considered the prime workforce group, and to rise for those above that age. There is less of an increase projected for 55-to-64 year olds. In 2002, 61.9% of Americans in this age group were in the workforce, a number that increased to 64.5% in 2012. The 2022 projection is that 67.5% will remain in the workforce. The figures are consistent with a 2009 Pew Research Center study that found the American workforce was graying — not just because the population as a whole was growing older, but because older adults were staying in the labor force longer and younger adults were staying out of it longer. This trend intensified during the recession and reflected a variety of factors: the need for older Americans to keep working either because of economic conditions or reductions in government and unemployment benefits; the greater number of women who had entered the workforce and chose to stay; and the improving health of older Americans that permitted them to stay active longer. The story is different for younger Americans. 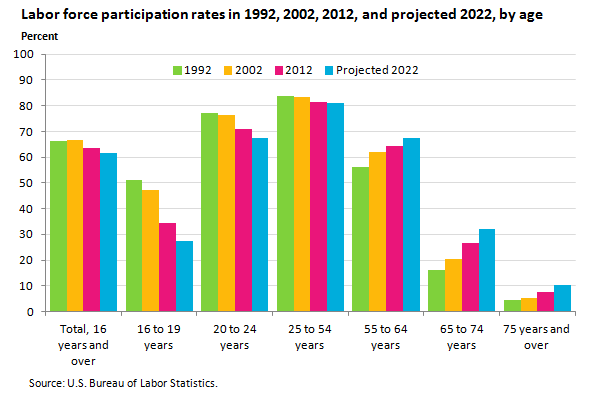 The share of 20- to 24-year-olds who were in the workforce stood at 76.4% in 2002, fell to 70.9% in 2012 and is projected to drop to 67.3% in 2022, which would be the lowest rate since 1969. A major reason for their decreasing labor force participation was an increase in school attendance at all levels – thus reducing the share of those young adults participating in the workforce compared with previous generations. A Pew Research analysis in Nov. 2012 found that a record share of young adults had finished both high school and college, reflecting in part the belief that a college degree is necessary to career success as well as the degree to which younger adults decided to return to school when they couldn’t find opportunities in the job market during the recession.